Former First Niagara Financial Group CEO John Koelmel is joining OnCore Golf as the new president of the fledgling Buffalo golf ball manufacturer. Koelmel joins OnCore as it is gearing up for the release of its Elixr tour golf ball next month – a key step in the company’s push to broaden its product line beyond its low compression Avant ball and its Caliber ball, which features a hollow metal core. Koelmel’s appointment gives OnCore an experienced executive as its president, joining local entrepreneur Keith Blakely, who serves as its chairman and CEO. Koelmel, an accountant who eventually became the managing partner of KPMG’s upstate operations, jumped to First Niagara, where he used a string of acquisitions to turn the former Lockport Savings Bank into an interstate banking company with branches stretching across upstate and into Pennsylvania and New England. 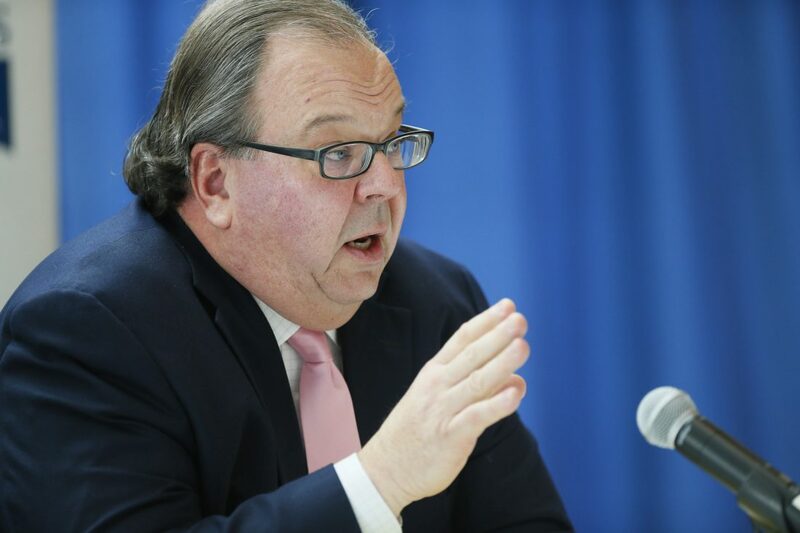 His aggressive purchase of many of HSBC USA’s upstate branches, however, didn’t work out as Koelmel had hoped and contributed to his ouster from First Niagara. He then took on the job as president of HarborCenter, the $200 million hotel and hockey complex built by Buffalo Bills and Sabres owners Kim and Terry Pegula next to the KeyCenter downtown. He left that job nearly two years ago and has since invested in several local startup and early-stage businesses, including OnCore, where he joined the board of directors in 2015. Koelmel becomes OnCore’s president at a time when the company is preparing to launch a third tour-level golf ball next month – a product introduction that OnCore officials believe will round out the company’s product line and put it in a position to ramp up its sales and marketing efforts. The company, which has focused on selling its balls through its website, plans to upgrade its online presence and bolster its sales force to gain a toe-hold in golf pro shops, Koelmel said. OnCore also has added Brian McGahey, a Buffalo native and a former Nike Golf representative as its director of business and player development, in hopes of signing secondary level tour professionals to use OnCore’s Elixr ball. “They’re ready to move to the next level. It’s time to go vertical,” Koelmel said. Blakely contacted Koelmel after he left HarborCenter in the summer of 2015. As a golfer, Koelmel said, OnCore immediately piqued his interest. Bret Blakely, Keith’s son and OnCore’s co-founder, said bringing Koelmel on board will help the company transition from a fledgling business where he and co-founder Steve Coulton had to take on a wide range of duties, even if they weren’t the best at it, to one where he and Coulton can focus on what they do well. “We’ve had to wear every hat at times, but now we’re at the point where we can bring in new people with expertise” Bret Blakely said. OnCore was formed in 2009 and later broke ground by manufacturing the first golf ball with a hollow metal core to be included on the United States Golf Association’s conforming list. The company touts its hollow core Caliber golf ball for its distance and accuracy. Its low compression Avant balls use the company’s SoftCell technology, which it says produces greater distance and feel, and sells for $20 a dozen, far less than most big-name golf balls. The top-of-the-line Elixr ball is geared toward low-scoring players. The company has less than 10 employees in Buffalo. Its balls are manufactured overseas.